Out in Harmony: Vancouver’s Gay, Bi, Trans, Queer, Lesbian, & Friends Choir is planning a professional logo redesign. Out in Harmony is accepting applications of interest from individuals or companies for a professional logo redesign and appropriate design elements to match. Intended logo usage will be on website, letterhead, physical signage, and t-shirts or other items. Deadline for proposals is November 4th, 2014. Please pass this call along to friends and contacts who may be interested in applying. Hello, friends. I hope you are all enjoying the summer. Did you know that Out in Harmony starts up again soon? Rehearsals start on September 9, which is only 15 days away! (Note that we’re starting the week *after* Labour Day, since it falls so early this year.) I hope you can all join us, including those of you we haven’t seen for a while. I look forward to seeing you all on September 9! Out in Harmony’s got rhythm, and we’ll be Shakin’ our Groove Thing while exploring some Fascinating Rhythms at our upcoming concert, Feel The Beat, on Saturday June 14th. From heartbeats to footsteps, from tides to seasons, from circadian rhythms to the circles of the stars… rhythms permeate our lives. Come join us for our toe-tappingest concert ever, and join us as we boogie, handjive, sway, disco, clap, stomp, and sing our way through an amazing evening of music that celebrates rhythm. In addition, we are thrilled to welcome a special guest, Dr. Timothy Van Cleave, who will be bringing his amazing percussion skills to add to our rhythmic exploration! Venue is wheelchair accessible. The doors will open at 7pm, and tickets are available at the door, from Little Sister’s Book Emporium, or through choir members. There will also be a 50/50 draw during the concert and a reception afterwards. As always, keeping our concerts accessible in all ways is a priority for us, so our ticket prices remain only $15, or we also have $10 concession tickets available for anybody who needs it. Children 12 and under are admitted free. We are always looking for volunteers, which will get you into the concert for free. If you would like to volunteer at the concert, please contact denise.garzon@gov.bc.ca by Tuesday June 3, 2014. We’re going to be performing for the residents of a seniors’ home tonight, so there won’t be a regular rehearsal this week. We hope you’ll think about coming along next week – this is a great time to join us as we start learning music for June! Out in Harmony is thrilled to be partnering with Tealeaves for our February fundraiser. They’ve even created the Rainbow Blend in our honour! Orders must be placed by February 28. We hope you’ll join in! To start fundraising for Out In Harmony, click on the following link and create your new member account: https://www.tealeaves.com/customer/account/login/. When you are ready to check out, enter the Promotion CODE: Harmony, and be sure to click on “verify code” below. Complete your Billing & Shipping Information. In the Shipping Method section, please select the option: Free Pickup (Harmony). This will ensure that your order is added to the OIH fundraising group. Tealeaves will donate 25% of all sales in this fundraising group to Out in Harmony. Orders will be distributed via the choir at the end of the fundraising period. If you are not a choir member yourself, please make a note of the choir member you are associated with in the Order Notes section next to Shipping Method. For those that don’t have a connection with a member please state in the Order Note section next to Shipping Method, “place order with Clemie”. ORDER DELIVERY: Tuesday, March 11th, 2014 The choir member that you are connected with or Clemie will pick up your order at choir rehearsal on the eve of Tuesday, March 11th, 2014. Said member will arrange a time after that for you to receive your order. Thank you for supporting the choir, and enjoy your tea! Are the days dragging you down, speeding by too fast, or maybe doing both at the same time? Prepare to put some pep in your step with Out in Harmony’s concert, It’s About Time, January 25th at our new venue, the Unitarian Church of Vancouver. We will be reflecting on the nature of time and how important a single moment can be, and doing so via snappy music, good friends, and warm hearts. You’ll hear us channelling Jim Croce while wishing we could save Time in a Bottle, agreeing with Snoopy that Suppertime is the very best time of day, and crooning along with Billy Joel in For the Longest Time. So join us for a great time by Steppin’ Out with your favorite Gay, Bi, Trans, Queer, Lesbian, & Friends community choir at the Unitarian Church of Vancouver on Saturday January 25th. Getting There: Accessible by #17(Oak Street) Bus or #49 (49th Ave) Bus. Nearest Skytrain Station is Langara-49th Station. Free parking available. Venue is wheelchair accessible. The doors open at 7pm, and tickets are available at the door, from Little Sister’s Book Emporium, or through choir members. There will also be a raffle draw during the concert and a complimentary reception afterwards. As always, keeping our concerts accessible in all ways is a priority for us, so our ticket prices remain only $15, or we also have $10 concession tickets available. Children 12 and under are admitted free, and no one will be turned away for lack of funds. Please note also we are always looking for volunteers. Please email denise.garzon@gov.bc.ca by January 10th if you are interested in volunteering. 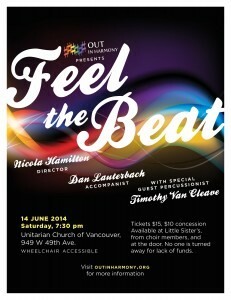 Hi there, friends of Out in Harmony! Can you believe that choir starts in two weeks? We hope that you can join us this year, and that you’ll invite any of your friends that might like to check us out. Our first rehearsal will be Tuesday, September 3, at 7:30. We’re still rehearsing in the wonderful space at St. Margaret’s Cedar Cottage Anglican Church, 1530 E 22nd Ave., just off the corner of Kingsway and Knight. Answers to frequently asked questions about the choir can be found here. Before we get back to singing, we’re going to have some non-musical fun! Next Tuesday, August 27, starting at 7:30, we’ll be at the church with board games. Come and reconnect with choir folks after the summer! Bring snacks, and friends who might be interested in meeting some of us before they jump into singing! Our next major concert is on January 25, and is entitled “It’s About Time”. The songs are all about, well, time – the passage of time, important moments, etc. Chances are, there’ll be a familiar song you’re happy to see, and something new to catch your interest. I hope you have a good couple of weeks, and I look forward to seeing your bright shining faces soon! We won’t be having a rehearsal tonight, since we’ll be singing for the lovely folks at Haro Park Centre, a seniors’ residence in the West End. We apologize for any inconvenience, and we’ll resume our regular schedule next week. Welcome to the 2018-2019 Choir Season!